Keeping Up With the Kapenga's: 20 Weeks...Halfway! 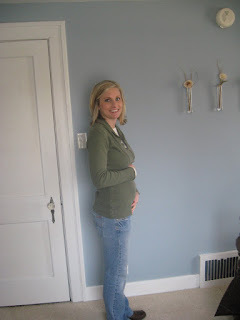 Here it is, the 20 week belly picture, Jenna took it for me this morning. As of today I have officially reached the halfway point...if I were to actually have the baby on my due date so it is probably wishful thinking that today is actually halfway. I have been feeling great and my belly bump grows a little more each day. Only a few more days until our ultrasound, and no, we haven't changed our minds about waiting to find out if it's a boy or girl. Once again, your bump is so tiny!! You look great! I cant believe how fast this is going either. Its crazy to think you're half way and I'm only 2 weeks behind you! Cant wait next week for our ultrasound either. See you tomorrow! You look great! Happy 1/2 Way point...Happy b-day to your hubby too. You are so tiny!! Wow, 20 weeks already! That's great that you're waiting to find out! It is so worth the wait! Did you find out with Jenna?